With the big day fast approaching a number of familiar faces have offered their support for Shwmae Sumae! Day. 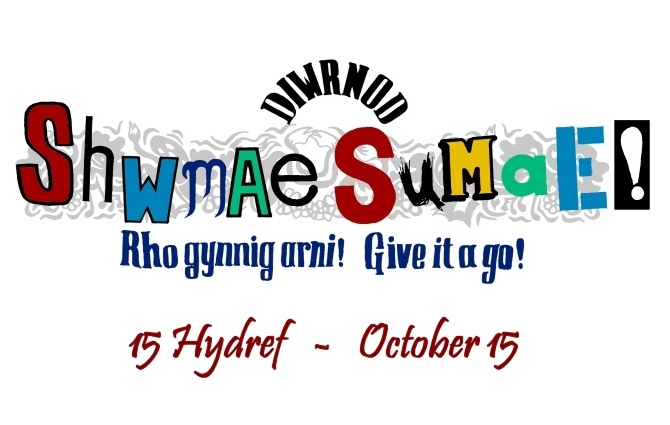 On October 15 there will be a number of events and activities taking place across the country to celebrate the Shwmae Sumae! The campaign aims to : • make Welsh more prominent in public • show that a language belongs to everyone in Wales, whatever their level of fluency • and ensure the use of Welsh throughout the year. In Pembrokeshire organizations such as the Urdd, YFC , Menter Iaith Penfro, Tŵf , Mudiad Meithrin, the Education Dept, Pembrokeshire College, Barclays Bank Merched y Wawr, Welsh for Adults and the National Park have teamed up to celebrate the day through organising flashmob events in four centers across the county. Gwent Welsh for Adults are hosting a stall at Big Pit, Blaenavon, while schools such as Archbishop Mcgrath, Bridgend and Maesteg High will take full advantage of the day to promote the language within the school and have some fun . There is also the opportunity to win a prize or get a bargain. In Bridgend, the 50th person to enter Siop yr Hen Bont and greet the owner with the word ” Shwmae ” will receive a special prize . Restaurant customers on Aberystwyth University campus will have access to a 10% discount if they order drinks in Welsh. There will be help at hand if for those struggling with Welsh! So don’t miss out! “The support of the University has been fantastic and I ‘m sure that it will be a day to remember, “ said the organiser, Jaci Taylor of the Mid Wales Centre Welsh for Adults, Aberystwyth University. At Crymych Tŷ Bach Twt is offering a £5 gift voucher to any customer who spends over £40 on the day and begins their conversation in Welsh. Remember it’s not too early to start Christmas shopping ! Mari Lovgreen, Shwmae Sumae! Champion and presenter of S4C’s Argyfwng 999 said : ” It’s great to think that so many activities has been planned for Shwmae Sumae! Day. It’s so important that Welsh will be heard and celebrated in all parts of Wales . On this year’s Shwmae day the Grŵp Deddf (South East Wales’ Welsh Language Officers) and I would be very grateful if you could help us by completing a (very!) short questionnaire below and give us your idea(s) about how we could increase the use of the language and create a stronger sense of Welsh identity. We are looking for ideas that could be easily adopted by everyone, rather than strategic ideas, with the intention of publishing them in a book called‘Gwnewch y Pethau Bychain’ (Do the little things) on St David’s Day 2014. In the book there will be ideas from the people of Wales of the small but (hopefully!) far reaching things each one of us can do to support and raise awareness of the Welsh language, and these will be arranged under the 4 main language transmission fields which are the community, the workplace, education and family. October 15, 2013 will be the first time that we celebrate Shwmae Su’mae? Day starting every conversation in Welsh. Shwmae Su’mae? Day is a golden opportunity to celebrate the Welsh language through the ways we greet each other in Welsh in our communities. It is also be an opportunity to support and encourage the efforts of all who are currently learning Welsh. The Welsh language belongs to everyone and we can all use the language everywhere! In the shop, youth club, work, in our community, with friends. Happy Hour – why not encourage learners in the workplace, community or school and hold a Welsh language session during your lunch break? Creating art work through various mediums, flags, badges, decorating old T-shirts, painting a mural or graffiti to decorate a wall at your school, nursery, or community centre. Flashmob – what about a video?